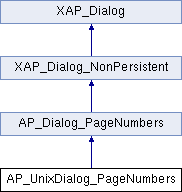 References AP_Dialog_PageNumbers::m_align, AP_Dialog_PageNumbers::m_control, m_recentAlign, m_recentControl, and m_unixGraphics. References abiDialogSetTitle(), XAP_App::getStringSet(), XAP_StringSet::getValueUTF8(), AP_Dialog_PageNumbers::id_CALIGN, AP_Dialog_PageNumbers::id_FTR, AP_Dialog_PageNumbers::id_HDR, AP_Dialog_PageNumbers::id_LALIGN, AP_Dialog_PageNumbers::id_RALIGN, localizeButton(), localizeButtonUnderline(), localizeLabelMarkup(), AP_Dialog_PageNumbers::m_align, AP_Dialog_PageNumbers::m_control, XAP_Dialog::m_pApp, m_previewArea, m_recentAlign, m_recentControl, newDialogBuilder(), s, s_alignment_changed(), s_position_changed(), and s_preview_draw(). References _constructWindow(), AP_Dialog_PageNumbers::_createPreviewFromGC(), AP_Dialog_PageNumbers::_updatePreview(), abiDestroyWidget(), abiRunModalDialog(), CUSTOM_RESPONSE_INSERT, DELETEP, XAP_App::getApp(), GR_UnixCairoGraphics::init3dColors(), AP_Dialog_PageNumbers::m_align, AP_Dialog_PageNumbers::m_answer, AP_Dialog_PageNumbers::m_control, XAP_Dialog::m_pApp, m_previewArea, m_recentAlign, m_recentControl, m_unixGraphics, m_window, XAP_App::newGraphics(), and UT_return_if_fail. Referenced by _constructWindow(), AP_UnixDialog_PageNumbers(), event_AlignChanged(), event_HdrFtrChanged(), and runModal(). Referenced by AP_UnixDialog_PageNumbers(), runModal(), and ~AP_UnixDialog_PageNumbers().